After fine cinematic transfers of Tinker Tailor Soldier Spy and A Most Wanted Man, not to mention the fabulous BBC adaptation of The Night Manager, John le Carré is currently enjoying something of a renaissance on screen. So the arrival of Our Kind of Traitor, directed by British filmmaker Susanna White from the author’s 2010 novel, is timely. Adapted by Oscar-nominated screenwriter Hossein Amini, who notably wrote the script for Nicolas Winding Refn’s Drive, this is contemporary – not Cold War – le Carré, but no less compelling for that. Beginning in Marrakech, the story zeroes in on middle class couple Perry (Ewan McGregor), an academic, and Gail (Naomie Harris), a lawyer, who are dining in a restaurant. At a nearby table is Dima (Stellan Skarsgård), a wealthy money launderer for the Russian mafia. Inviting Perry over for a drink, and then to a lavish party, it transpires that Dima is looking for help; convinced that his life is in danger from the criminals he associates with, he wants to turn over evidence to British Intelligence in exchange for asylum. Before he really knows what’s happening, Perry is bringing information back through customs and taking hush-hush meetings with government officials, led by Damian Lewis’ Hector. Needless to say, nothing is ever simple in le Carré’s world, with conspiracies and cover-ups aplenty as Perry and Gail find themselves dragged into espionage drama far beyond their experience. 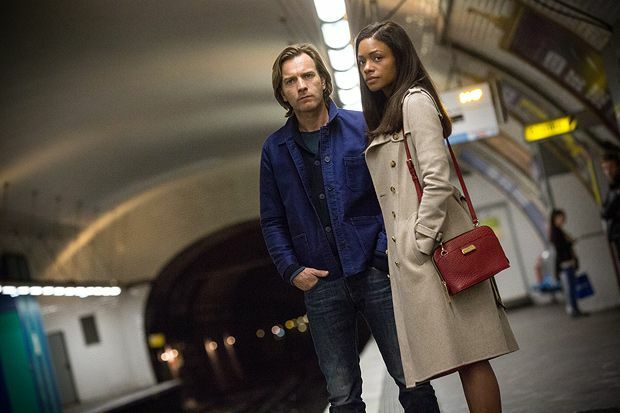 Lacking the energy of other recent le Carré adaptations, Our Kind of Traitor is really a story about what happens when the everyday smashes into the extraordinary, and it works best as a study of Perry and Gail’s frayed relationship. White (whose credits include TV dramas Generation Kill and Parade’s End) keeps things ticking over, with McGregor offering one of his more considered performances. Unsurprisingly, a larger-than-life Skarsgård is the show-stopper, even if the film as a whole is solid rather than spectacular. Middle-class couple Perry (McGregor) and Gail (Harris) are dining in a Marrakech restaurant when a wealthy Russian criminal (Skarsgård) invites himself into their lives. despite all the cover-ups and conspiracies, it works best as a study of Perry and Gail's frayed relationship. Solid rather than spectacular.